These earrings are lovely, colorful and charming! 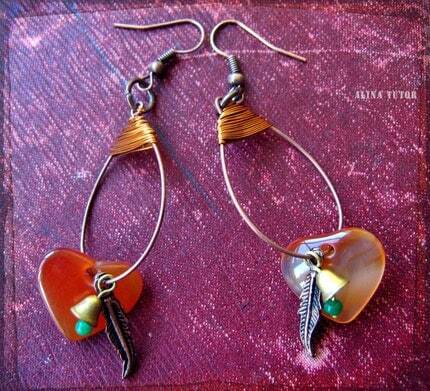 The heart shaped carnelian gemstones are accompanied by detailed brass feathers and cute tiny bells with little green bead at the ends. The top of the hoops is wrapped with copper wire and attached to antiqued brass earwires. Wear these with your favorite summer dress or just to add a little color to your casual appearance. Folksy :: Buy "Agate and Copper Earrings"
Folksy Handmade "Earrings Polymer Clay with Copper, Amber and Aqua Shades"
Folksy :: Buy "Copper Hoop Earrings"